Bathroom Vanities and Accessories Design and Tips | DecorPlanet.com Blog: Who will be the next president to use the White House bathroom? Who will be the next president to use the White House bathroom? On Wednesday, Nov. 7, we will finally know whether President Barack Obama or former Massachusetts Governor Mitt Romney will be the next leader of the free world. However, most of us still won't know first hand what kind of bathroom accessories can be found in the presidential lavatories. According to the White House History Museum's website, the famous building contains 35 bathrooms. Beginning with the inauguration of Franklin Pierce in 1853, the master bathroom on the family floor probably contained a wooden toilet and porcelain sink. In addition, its decor included wallpaper designed to resemble wood and faux tile cloth floors. Less than a decade later, when Abraham Lincoln was president, running water from the Potomac River was being shipped in to create what was then considered a very high tech amenity. 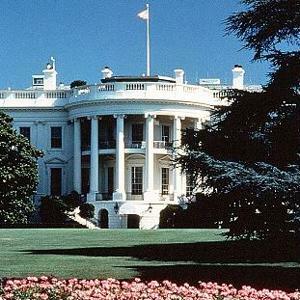 A brief historical overview from the website Plumbing Supply notes that plumbing in the White House was still a major on-going concern until a major renovation in 1902. As the White House is considered public property, the Senate hasn't always approved as much tax money for renovations as one may think would be afforded to luxurious living quarters. For example, Harry Truman supposedly mandated a major overhaul of the building in 1948, upon noticing his bathroom floor was beginning to give way to the bathtub. As for the number of bathrooms, the White House historical website notes that the family quarters only contained a pair of bathrooms before 1900 - one for the President's personal use and another for his family members and guests. In 1902, silver faucets, handles and white porcelain were installed in both presidential lavatories. In 1909, the country elected its fattest President of all time, William Taft, who got stuck in the normal-sized bathtub and needed help getting out on at least one occasion. In light of his difficulty fitting into the bathtub, he ordered a 7-foot long, 41-inch wide tub be placed in his master bathroom. A picture on the White House Museum website shows that four men could fit comfortably in the tub. Every following president up until Dwight D. Eisenhower may have taken baths in the massive apparatus until, well after Taft's exit from office, it was replaced with an updated accommodation in 1952.